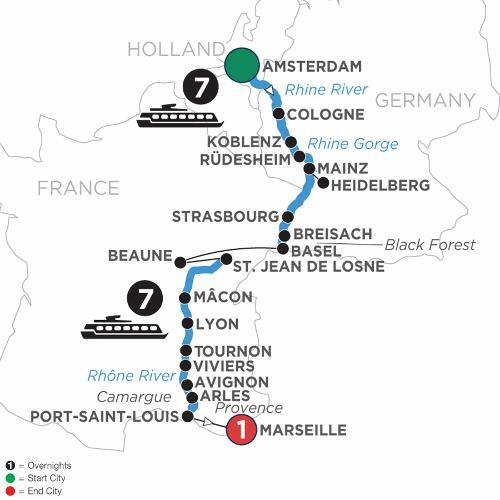 This fabulous European river cruise along the Rhine, Saône, and Rhône Rivers combines the best of Holland, France, and Germany. Begin in Holland’s vibrant capital of Amsterdam, with a canal cruise through the 700-year-old city. Visit Cologne, Germany, a 2,000-year-old city known for its gothic architecture and famous twin-spired cathedral, and sail through the dramatic Rhine Gorge. Strasbourg, France, located on the French-German border, perfectly blends the cultures of both countries, and Breisach, Germany, is the gateway to the unrivaled natural beauty of the Black Forest. Taste some of Burgundy wines on board your ship, and visit the Chardonnay wine region. Cruise to France’s culinary capital of Lyon, and visit the Place des Terreaux fountain of famous postcards, then visit the Beaujolais region to taste famous wines.